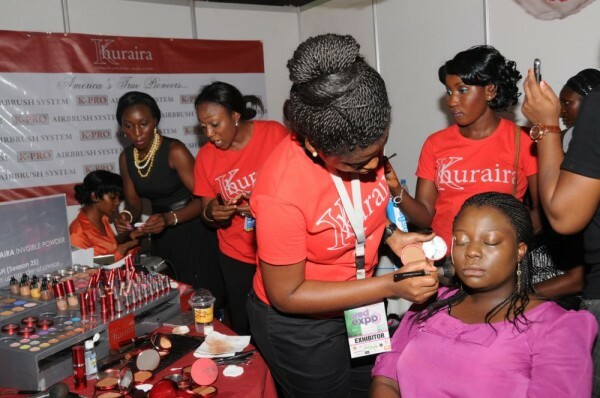 A few weeks ago - 24th and 25th March to be precise, I worked at the Khuraira cosmetics stand at the first WED Expo here in Lagos, Nigeria. it was a very fun and tiring experience especially in consideration of the fact that we did free makeovers at the stand on the very first day of the Expo. My back was killing at the end of the first day. Want to guess which of the red t-shirt clad ladies is me? That's you with the braids, right? Hard at work! I can see how your back would be aching you after all this. Pele. I'm glad you had fun though. I shall lookout for the reviews. thank you @The Relentless Builder. I really did have fun and imagine my surprise when i saw myself on Bellanaija. I just had to share the picture, lol. And be sure to check out the reviews when they are posted.